Well it's the Victoria Day weekend in Canada again and what better way to celebrate a holiday weekend than with a giveaway. 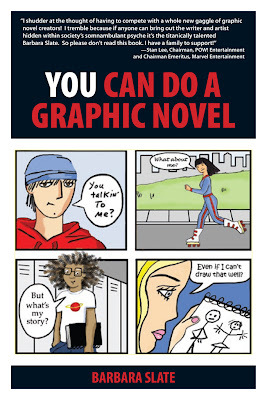 "You Can Do A Graphic Novel" ,is written by Barbara Slate and is quite an interesting little book. When I first received the book and gave it a quick once over I was a little skeptical but as I settled down to read it thoroughly I realized it's possibilities. I have been working on some curriculum projects that combine Creative Writing and Visual Arts with a colleague of mine and I can see how well this book fits in with these ideas. 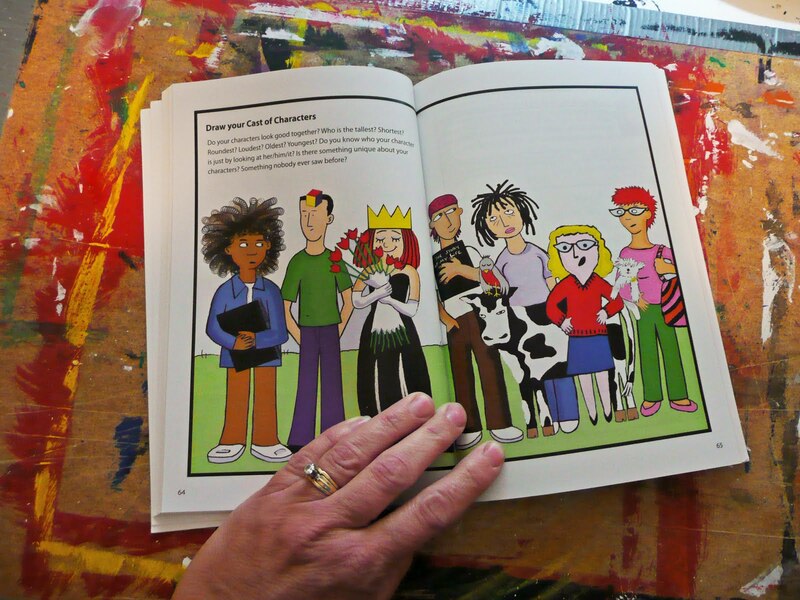 Although Barbara is detailing the process of creating a Graphic novel she walks you through core writing skills like creating characters, developing plot, how to write to keep people interested, and then pulling it all together with drawing/illustration. It's written in a very comfortable way and you could easily work through this process in a classroom setting, from elementary on. She even has a teacher's guide available. Both my boys are in love with graphic novels and have been so since pre-school. Here is a comic that my middle son completed when he was 5. It's poster size (22x28) and he was so proud of all the work he put into this that I framed it. 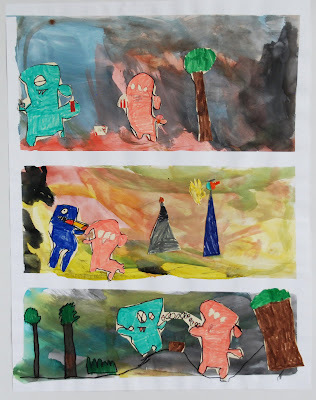 He came up with the story, the characters (the Uglies), painted the backgrounds and even added some text. It helped him develop his storytelling skills in a fun way and kept his interest from start to finish over a couple of weeks. Not easy to do with a 5 yr.old. So now to the giveaway. I have 3 copies ,that's right 3 chances for you to win. 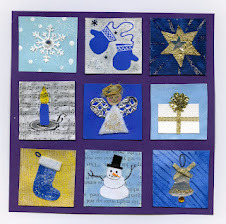 If any of you are interested just leave me a short comment on the blog or through email and I'll enter you into the giveaway. This giveaway is only open to residents of the U.S.A. and Canada. Sorry all my international friends but thems the rules! I am off to the cabin for the weekend so I'll leave this giveaway open until the end of Monday May 30th. I'll announce the 3 winners on the following Tuesday. Good Luck and I'll see you next week. What a great giveaway! As a teacher, this would be a great assest in writing, especially for boys. Thanks for the chance. Looks like an interesting book to explore with my kids. That looks awesome! Thank you, my 8 year old would love this one. I tried a Manga art lesson to integrate writing, but the results were not what I was looking for.. I could definitely use some help! Thanks..
Oh would love to win, this book looks like a fun summer project to do with my kids. This sounds like an awesome book to go through with my son and daughter! Thanks for the opportunity! My boys would love this book. Thanks for the give-away and your wonderful blog! What fortuitous timing, as we've just decided to include a graphic novel class at our homeschool co-op in the fall! Thanks for the chance! I would love to add this book to my collection. I just borrowed Jessica Abel and Matt Madden's book "Drawing words and Writing Pictures: A definitive course from concept to comic in 15 lessons," from our school library. It's a great resource or secondary level book for developing your own stories and then illustrating them. I teach a lesson on graphic novels every year- in fact my high school Art I class just finished theirs. This book sounds like a great resource. Thanks for the info! Thank you for triple the opportunity! My daughter wants to be an author/illustrator. She would love this book and I would love to see her inspired to write more! Thanks for the giveaway. Looks like an interesting book! My son is also crazy about graphic novels, we can't get him interested in any other kind of book! We recently went to Disney World and all things Disney there. He picked up some graphic novels in Hollywood Studios with his own money and after he read them he begged me to take him back to HS the next day to get more! He is in 2nd grade and now is into drawing from the books, which has been wonderful to watch him grow! I'd love to win this book to see what he could do! I'd like to have a copy for my grandson. He loves to draw, and you never know where talent will lead you. Thanks for a chance. This would be a fabulous tool to use. I've had kids write a comic strip, but I've not tried the graphic novel. Would be great in my classroom! What a fantastic resource for teachers. Thanks for making it available to us. 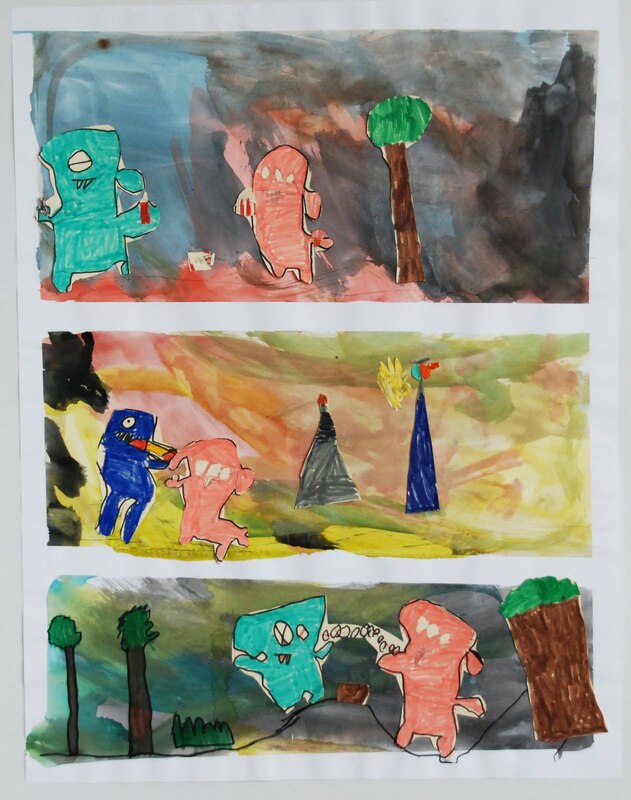 There is a tremendous opportunity in Visual Arts to integrate literacy skills. Sounds like a fun project. What a great giveaway! Much of my professional development this year has been spent learning more about boy writers. As a teacher, I know this would be such a great resource in my classroom and I know just the boys (and girls) who would LOVE this! Thanks for the chance to win. Sounds like a wonderful resource! Thanks for the chance to win my won copy! My 9yo would love this. Thanks for the opportunity. As a middle school art teacher, I would love to have this book as a resource for a NEW lesson developing in my mind as I type that would ESPECIALLY appeal to my male students! Thanks for the chance to win! 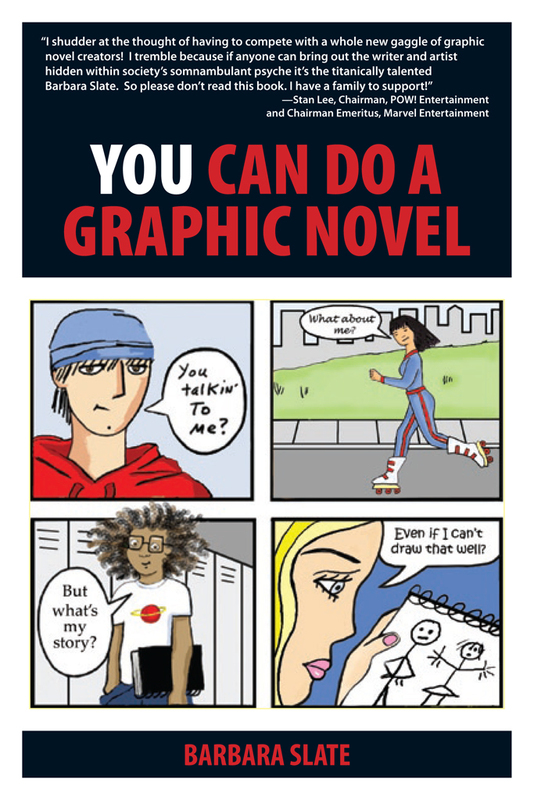 I'd love to include graphic novels as a genre study in my 2nd grade classroom. The boys LOVE them. Thanks for letting me know about the book and the chance to win! I am a grade 6 teacher and I know my students would have a blast doing this. It would be a great project for that last week between PAT's and end of school. 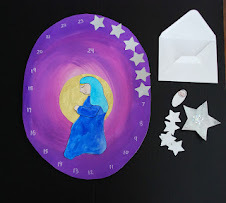 I love reading your blog and art lessons, they are so much fun.. My kids would LOVE this!!! Oh I would love to have one of these. I am the homeschooling mother of 7 kids, including three reluctant writers who love reading graphic novels. This would be such a great addition to our school! Love all of your posts! Thanks for the give-away opportunity. I have students learning about manga, anime and comics,and would love to add this to my reference material. good luck all! I know I have some students who would be interested in that book. Please enter me...thanks! What a wonderful giveaway! I know a 17 year old who lives at my house who would have a ball with this! Please enter me! My Mom is a new 7th grade teacher with 40 kids and would love to create some cool stuff! What a great idea for a book! I have 3 boys that would love this idea! One is already a quite the little artist and story teller... this would be just up his alley! Thanks for the chance! 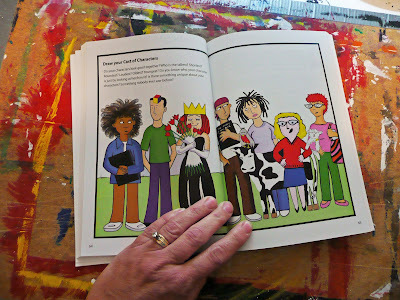 As a mother of an avid graphic novel reader and a teacher this book would be a fun project for home and the classroom. Thanks for the chance! I teach a comic book elective as well as all of the regular art courses and this would be a great resource for me!! I'm just starting a Comic book lesson with 6th grade! We are using Comic Life software and love it ! This would be great to show how to write a plot and develop characters! Thanks for the opportunity! I work with children in a therapy setting. I have seen how art can transform self-esteem. This would be a great resource for children. Thank you so much for the giveaway. My son would eat this up! My daughter eats all things up 'art', as she informs me that she will be an artist when she grows up. Thank you for your site, she is exposed to many different types of media and ideas here. What a great giveaway! 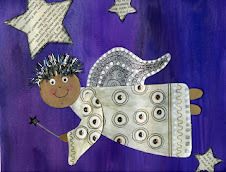 I am an artist, but I also am thinking about one of my grandchildren....she would love this book. Thank you for the opportunity to win. Wow! My son enjoys graphic novels and drawing but is not big on writing. This may just help in that area. Thanks for hosting this giveaway! I always wanted to create some sort of graphic novel with my fifth grade students, but I couldn't get many good ideas. This book looks like it has great ideas! This book is on my summer reading list...it would be wonderful to win a copy! Great ideas to incorporate literacy in my elementary art program. This would be perfect for my daughter who has been trying to write a graphic novel, but has been stalled at the starting point. Thank you for sharing this book! I have some kids that would love that! 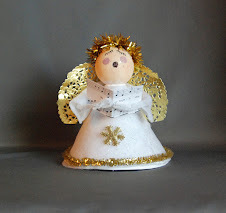 Neat ideas to inspire!